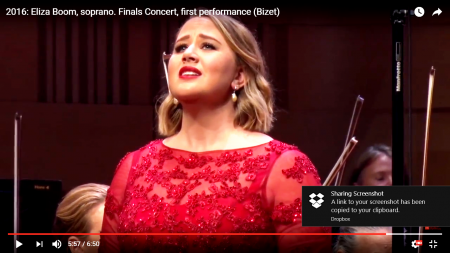 So for those of you who have asked if and when you can watch Ellie singing with the orchestra at the finals concert, here’s the link to one of her songs. Just click on the link below the photo. There are more on You Tube – both her semi-finals songs and the two at the finals. Also the whole finals night has been put on You Tube. Enjoy. We have just watched Eliza. So beautiful. The complete package. did not go through to your email. Please can you send me your email again so that I can send them off. It was so lovely to see you both on the weekend and talk. And of course share the excitement of Ellie’s win. I’ve just done a test and it is working. :) Try again, but if for some reason it doesn’t work, please don’t worry about it. I actually got a few really nice photos myself on my phone. Thanks so much! Take care.